Insect antennae are paired appendages used for sensing in anthropods. Antennae are connected to the front-most segment of the insect and are the primary olfactory sensors of insects. Insect antennae come in a number of different shapes, each of which is labeled above. 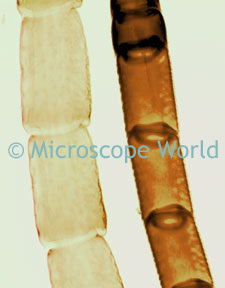 Insect antennae captured at 100x magnification under a student biological microscope.